It should have been a day to remember: in the meadows beyond the school summer camp, Bobby had his first kiss. But when a slung rock shatters his friend Breck’s front teeth, Bobby must be punished… He’ll spend the rest of his life trying to forget Assistant Principal Diabolus and the terrible things that happened in that lonely cabin. The years pass in a haze. Diabolus haunts Bobby and his friend Willis like a specter, preying on their bodies when backs are turned. By the time he graduates, Bobby is a shell of the man he might have been; he spends his days and nights stumbling between college bars, his thoughts drifting again and again to suicide. But when Ardee, an old girlfriend on her way home from college, finds Bobby passed out in the street, his journey toward recovery—and revenge—can finally begin. 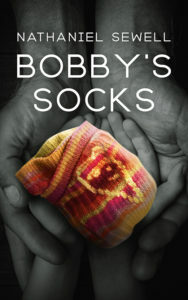 Bobby’s Socks is the moving story of one man forced to confront his abusive past, and is a sober reminder that, through love and healing, suffering can be transcended—and evil confronted. All I can write after reading this book, this is how I felt. I think this author captured what victims feel and why 99.9% never tell anyone. Thank you. Bobby’s Socks unlocks the inner-workings of the sexually abused victim’s mind, the subsequent epigenitic implications & suicidal battles. For those who are victims, this book provides a medium to no longer feel alone. For those who are not, it paints a picture of what many around you have experienced & how to help. The book is one to pick up & finish in a day…. It inspires and compels. You will be driven to take positive action. This was an amazing story and written so well. The horrors that Bobby experiences and lives through are vivid and leave the reader feeling scarred as well. However, Nathaniel Sewell expertly doles out dollops of hope at regular intervals so a reader isn’t overcome with grief and continues reading safe in the knowledge that things are going to work out for Bobby, even if they don’t work out for everyone else. As it is, things are made better for more than just himself as hundreds of other abused children are also spared from a predator and countless future children are safe from his clutches. I found the epilogue a bit off-putting. The switching from third to first person left me wondering what was real and what was fiction. I’m not sure it was a necessary change. It was also a bit choppy as it jumped around timewise. Still, it gave the perfect conclusion to the story, showing how Bobby not only advanced science in terms of Epigenetics (something the scientist in me will be researching!) but uplifting people with happy socks. 🙂 Making his passion also his income is just fabulous. This book is not for the faint of heart, but I think it holds lessons for all and is a wonderful read for those who are brave enough to be honest with themselves and each other. The Bobby’s Socks Foundation Mission is to help fund abuse shelters, with our time and resources, so victims know there are safe places that welcome them. The kaleidoscope of colorful woven socks symbolises our collective purpose that every child is special, every child is unique, children should know there are others who will defend them. We will protect them from the harm of sexual abuse and fight back against predators through all legal means. We will investigate and endorse approved shelters where a victim can seek a non-judgemental ear to listen, provide therapy, and a place were they can feel safe and begin to heal. There is not just one sock pattern, there are many different, unique patterns to choose from as in the unique life stories of each abuse survivor. Pick a pattern that causes you to smile, laugh and to help you seek happiness or simply join our cause to take a stand against predators. We found a wonderful Network of Knitters through Etsy. They all make colorful hand-crafted socks that will make your heart happy. Simply click on any of these photos to be directed to the appropriate Etsy shop to get your socks. All of the knitters have agreed to donate a portion of their proceeds to the Bobby’s Socks Foundation to help fund abused children’s shelters.